13 A None No Power Seat 13 A is a standard Business Class seat whose proximity to the lavatories and galleys may be bothersome. 13 K None No Power Seat 13 K is a standard Business Class seat whose proximity to the lavatories and galleys may be bothersome. 14 A None No Power Seat 14 A is a standard Business Class seat that may have extra legroom due to the exit however, the proximity to the lavatories and galleys may be bothersome. 14 E None No Power Seat 14 E is a standard Business Class seat that may have extra legroom due to the exit however, the proximity to the lavatories and galleys may be bothersome. 14 F None No Power Seat 14 F is a standard Business Class seat that may have extra legroom due to the exit however, the proximity to the lavatories and galleys may be bothersome. 14 K None No Power Seat 14 K is a standard Business Class seat that may have extra legroom due to the exit however, the proximity to the lavatories and galleys may be bothersome. 31 A None No Power Seat 31 A is a standard Premium Economy Class seat that may have restricted legroom due to the position of the bulkhead. The tray table is in the armrest, making the armrest immovable and slightly reducing seat width. There is no floor storage for this seat during take-off and landing. 31 C None No Power Seat 31 C is a standard Premium Economy Class seat that may have restricted legroom due to the position of the bulkhead. The tray table is in the armrest, making the armrest immovable and slightly reducing seat width. There is no floor storage for this seat during take-off and landing. 31 D None No Power Seat 31 D is a standard Premium Economy Class seat that may have restricted legroom due to the position of the bulkhead. The tray table is in the armrest, making the armrest immovable and slightly reducing seat width. There is no floor storage for this seat during take-off and landing. This seat has a bassinet location. 31 E None No Power Seat 31 E is a standard Premium Economy Class seat that may have restricted legroom due to the position of the bulkhead. The tray table is in the armrest, making the armrest immovable and slightly reducing seat width. There is no floor storage for this seat during take-off and landing. 31 F None No Power Seat 31 F is a standard Premium Economy Class seat that may have restricted legroom due to the position of the bulkhead. The tray table is in the armrest, making the armrest immovable and slightly reducing seat width. There is no floor storage for this seat during take-off and landing. 31 G None No Power Seat 31 G is a standard Premium Economy Class seat that may have restricted legroom due to the position of the bulkhead. The tray table is in the armrest, making the armrest immovable and slightly reducing seat width. There is no floor storage for this seat during take-off and landing. This seat has a bassinet location. 31 H None No Power Seat 31 H is a standard Premium Economy Class seat that may have restricted legroom due to the position of the bulkhead. The tray table is in the armrest, making the armrest immovable and slightly reducing seat width. There is no floor storage for this seat during take-off and landing. 31 K None No Power Seat 31 K is a standard Premium Economy Class seat that may have restricted legroom due to the position of the bulkhead. The tray table is in the armrest, making the armrest immovable and slightly reducing seat width. There is no floor storage for this seat during take-off and landing. 33 A None No Power Seat 33 A is a standard Premium Economy Class seat that is missing a window. 33 K None No Power Seat 33 K is a standard Premium Economy Class seat that is missing a window. 35 D None No Power Seat 35 D is a standard Premium Economy Class seat however, the proximity to the lavatories may be bothersome. 35 G None No Power Seat 35 G is a standard Premium Economy Class seat however, the proximity to the lavatories may be bothersome. 36 A None No Power Seat 36 A is a standard Premium Economy Class seat however, the proximity to the lavatories may be bothersome. 36 C None No Power Seat 36 C is a standard Premium Economy Class seat however, the proximity to the lavatories may be bothersome. 36 H None No Power Seat 36 H is a standard Premium Economy Class seat however, the proximity to the lavatories may be bothersome. 36 K None No Power Seat 36 K is a standard Premium Economy Class seat however, the proximity to the lavatories may be bothersome. 37 A None No Power Seat 37 A is an Economy Class seat that may have extra legroom due to the exit however, the close proximity to the lavatories may be bothersome. The tray table is in the armrest, making the armrest immovable and slightly reducing seat width. There is no storage under this seat during takeoff and landing. 37 B None No Power Seat 37 B is an Economy Class seat that may have extra legroom due to the exit however, the close proximity to the lavatories may be bothersome. The tray table is in the armrest, making the armrest immovable and slightly reducing seat width. There is no storage under this seat during takeoff and landing. 37 C None No Power Seat 37 C is an Economy Class seat that may have extra legroom due to the exit however, the close proximity to the lavatories may be bothersome. The tray table is in the armrest, making the armrest immovable and slightly reducing seat width. There is no storage under this seat during takeoff and landing. 37 H None No Power Seat 37 H is an Economy Class seat that may have extra legroom due to the exit however, the close proximity to the lavatories may be bothersome. The tray table is in the armrest, making the armrest immovable and slightly reducing seat width. There is no storage under this seat during takeoff and landing. 37 J None No Power Seat 37 J is an Economy Class seat that may have extra legroom due to the exit however, the close proximity to the lavatories may be bothersome. The tray table is in the armrest, making the armrest immovable and slightly reducing seat width. There is no storage under this seat during takeoff and landing. 37 K None No Power Seat 37 K is an Economy Class seat that may have extra legroom due to the exit however, the close proximity to the lavatories may be bothersome. The tray table is in the armrest, making the armrest immovable and slightly reducing seat width. There is no storage under this seat during takeoff and landing. 38 D None No Power Seat 38 D is a standard Economy Class seat that may have restricted legroom due to the position of the bulkhead. The proximity to the lavatories may be bothersome. The tray table is in the armrest, making the armrest immovable and slightly reducing seat width. There is no floor storage for this seat during take-off and landing. 38 E None No Power Seat 38 E is a standard Economy Class seat that may have restricted legroom due to the position of the bulkhead. The proximity to the lavatories may be bothersome. The tray table is in the armrest, making the armrest immovable and slightly reducing seat width. There is no floor storage for this seat during take-off and landing. 38 G None No Power Seat 38 G is a standard Economy Class seat that may have restricted legroom due to the position of the bulkhead. The proximity to the lavatories may be bothersome. The tray table is in the armrest, making the armrest immovable and slightly reducing seat width. There is no floor storage for this seat during take-off and landing. This seat has a bassinet location. 49 C None No Power Seat 49 C is a standard Economy Class seat however, the proximity to the galleys may be bothersome. 49 H None No Power Seat 49 H is a standard Economy Class seat however, the proximity to the galleys may be bothersome. 49 J None No Power Seat 49 J is a standard Economy Class seat however, the proximity to the galleys may be bothersome. 49 K None No Power Seat 49 K is a standard Economy Class seat however, the proximity to the galleys may be bothersome. 50 A None No Power Seat 50 A is a standard Economy Class seat however, the proximity to the galleys may be bothersome. 50 B None No Power Seat 50 B is a standard Economy Class seat however, the proximity to the galleys may be bothersome. 50 C None No Power Seat 50 C is a standard Economy Class seat however, the proximity to the galleys may be bothersome. 51 A None No Power Seat 51 A is an Economy Class seat that may have extra legroom due to the exit however, the close proximity to the galleys may be bothersome. The tray table is in the armrest, making the armrest immovable and slightly reducing seat width. There is no storage under this seat during takeoff and landing. 51 B None No Power Seat 51 B is an Economy Class seat that may have extra legroom due to the exit however, the close proximity to the galleys may be bothersome. The tray table is in the armrest, making the armrest immovable and slightly reducing seat width. There is no storage under this seat during takeoff and landing. 51 C None No Power Seat 51 C is an Economy Class seat that may have extra legroom due to the exit however, the close proximity to the galleys may be bothersome. The tray table is in the armrest, making the armrest immovable and slightly reducing seat width. There is no storage under this seat during takeoff and landing. 51 D None No Power Seat 51 D is a standard Economy Class seat that may have restricted legroom due to the position of the bulkhead. The proximity to the galleys may be bothersome. The tray table is in the armrest, making the armrest immovable and slightly reducing seat width. There is no floor storage for this seat during take-off and landing. 51 E None No Power Seat 51 E is a standard Economy Class seat that may have restricted legroom due to the position of the bulkhead. The proximity to the galleys may be bothersome. The tray table is in the armrest, making the armrest immovable and slightly reducing seat width. There is no floor storage for this seat during take-off and landing. 51 G None No Power Seat 51 G is a standard Economy Class seat that may have restricted legroom due to the position of the bulkhead. The proximity to the galleys may be bothersome. The tray table is in the armrest, making the armrest immovable and slightly reducing seat width. There is no floor storage for this seat during take-off and landing. 51 H None No Power Seat 51 H is an Economy Class seat that may have extra legroom due to the exit however, the close proximity to the galleys may be bothersome. The tray table is in the armrest, making the armrest immovable and slightly reducing seat width. There is no storage under this seat during takeoff and landing. 51 J None No Power Seat 51 J is an Economy Class seat that may have extra legroom due to the exit however, the close proximity to the galleys may be bothersome. The tray table is in the armrest, making the armrest immovable and slightly reducing seat width. There is no storage under this seat during takeoff and landing. 51 K None No Power Seat 51 K is an Economy Class seat that may have extra legroom due to the exit however, the close proximity to the galleys may be bothersome. The tray table is in the armrest, making the armrest immovable and slightly reducing seat width. There is no storage under this seat during takeoff and landing. 61 C None No Power Seat 61 C is a standard Economy Class seat however, other flyers tend to bump into this seat. 61 H None No Power Seat 61 H is a standard Economy Class seat however, other flyers tend to bump into this seat. 62 D None No Power Seat 62 D is a standard Economy Class seat however, the proximity to the lavatories may be bothersome. 62 G None No Power Seat 62 G is a standard Economy Class seat however, the proximity to the lavatories may be bothersome. 63 B None No Power Seat 63 B is a standard Economy Class seat in the last row of the aircraft whose proximity to the lavatories and galleys may be bothersome. 63 J None No Power Seat 63 J is a standard Economy Class seat in the last row of the aircraft whose proximity to the lavatories and galleys may be bothersome. 64 G None No Power Seat 64 G is a standard Economy Class seat in the last row of the aircraft whose proximity to the lavatories and galleys may be bothersome. China Southern flies this Boeing 777-300ER in a four class configuration with 4 flat bed First Class seats, 34 flat bed Business Class seats, 44 Premium Economy seats, and 227 standard Economy seats. 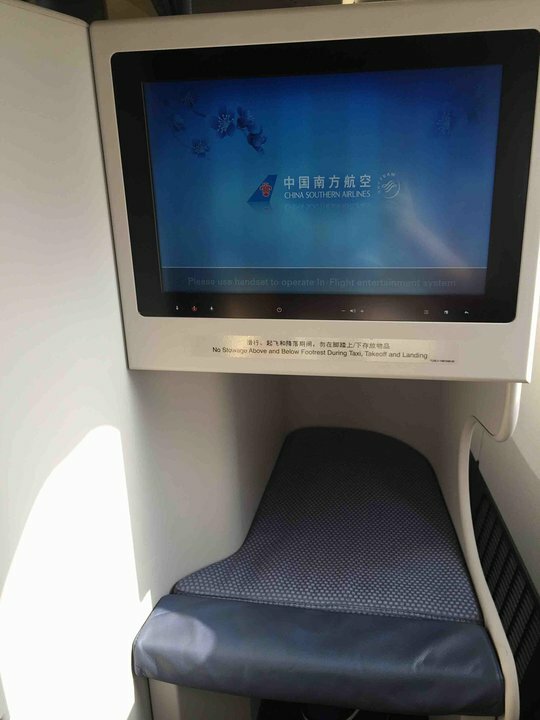 The China Southern Airline 777 is an awesome plane with a very nice business class configuration, all the business class seats have direct access to the aisle. Also the seat have a large tv with a ok movie and tv selection. The only thing that I don't like is that the amenity kit is one of the worst on a long haul business class seat. Otherwise the China Southern Airline is a great product for the amount of money your going to pay. This was my 3rd round trip from Cambodia to the US with China Southern. All flights have been great every time. 14A and K are bulkead windows in the 2nd of 2 business class cabins. It was a bit annoying having the curtain to the galley and restroom right in front of me. Better to go with rows 11 - 13 for more quiet and privacy. If you plan ahead and can secure their discount business class fare, there is no better value in the sky. The seat is 180 degree lie flat with 100% aisle access. The cushions are a bit "firm". Decor is reminiscent of a dentist office. 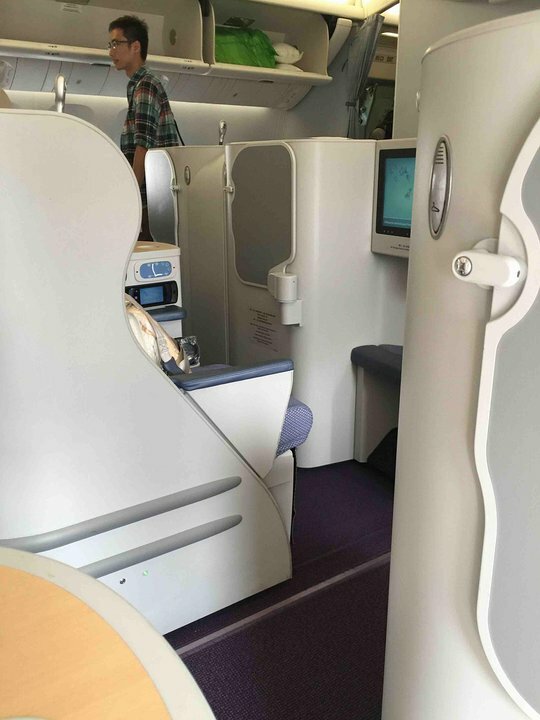 But if what matters most is lie-flat, aisle access and good value, China Southern rocks! Window seats offer the most privacy. Movie selection is only fair, food is unremarkable, but in-flight service is exceptionally attentive. US carriers seem to just leave snacks out for self service, but CZ offers a nice snack menu served at your seat. CZ300: JFK-CAN. 34K Premium Economy. Seat recline and space was excellent for the 15+ hour flight. Seat cushion is slightly firm for larger passengers, and therefore a numb rear-end is inevitable. The relatively small cabin means more privacy and less intrusion by other travellers. My seat DOES have an electrical outlet. 57G is a normal economy seat with the exception that the overhead luggage bin is sealed. You have to use space allocated for other passengers and there is no notification to warn you in advance. Horrible! I flew from Auckland to Guangzhou on this aircraft, 11 hours overnight. I could not sleep, I have never been so uncomfortable in a plane. The seat had no springiness, it was like sitting on sand. Every ten minutes I had to wriggle to try to ease the ache in my muscles. (After Guangzhou, in an old domestic China Southern A320 with normal seats, I was perfectly comfortable). I will never risk flying in a B777 again. With all the mixed reviews I was very concerned about the experience we'd have. My fears were quickly put to rest. This was a fantastic, new plane! There were tons of movies, TV shows, etc. The food was great. The flight attendants were extremely polite, constantly smiling and offering help with any request. Everyone's English was fine, with some being impeccable. The seat was very comfortable. We had an enjoyable flight and I wouldn't hesitate to fly China Southern again. The only not-so-great part was the CAN airport. It's apparently under construction. You have to take a bus from the plane to the terminal and back again for a connection. They didn't load us onto a "VIP" bus for our connection and it was pouring rain. I don't fault the airline for this however. Best Business Class Value in the Sky. I'm a former airline employee and very picky about airline quality and service, but I also know what's realistic and what isn't. Before buying this ticket, and even right up to departure, I read dozens and dozens of reviews, which were all over the place. Hard to really know what to expect. The price was phenomenal for long-haul business class, pretty much half of any other option, so definitely worth taking the chance. Siem Reap to Guangzhou on an A321. Fairly standard short-haul business class seat. What made it stand out was the tablet they provided to watch movies. Service was great. Food was decent. Guangzhou to San Francisco was on a 777. Very modern, comfortable lie-flat seats, all with direct aisle access. Easy-to-use controls. No climbing over anyone or being climbed over. Normal width and legroom. Good-sized video monitor and easy-to-use controls with a decent selection of movies, multiple languages, new and old. Again, service was great and food was pretty good. They use the Plaza Premium Lounge in Siem Reap, which is actually better than many major airline lounges I've been to. The China Southern lounge in Guangzhou had comfortable furniture, comparable to most airline lounges. Snacks and drinks were adequate. My only complaint was that it was very warm, but no one seemed to mind so maybe it was just me. Be aware that Guangzhou is a very busy airport without adequate gate space. Probably more planes remotely parked than those at a proper jet bridge. The existing terminal is being worked on and an additional one being built. All of this I think contributed to the long delays and cancellations due to a really bad storm that went through there that afternoon. Besides difficulty getting planes in and out, shuttling passengers between terminals and planes probably took a lot longer. The gate agents did a pretty good job, considering all the challenges. Reviewers who compare these flights to the very top-tier carriers should consider the price difference. Considering the $2,900 saved on this trip compared to nearly every other competitor, I was thrilled. Slept like a baby. Premium Economy has very limited seat recline, and is not comfortable for sleeping on long flights. Since the armrests do not fold up, it's not very good for small children to stretch out to sleep. Otherwise, the amenities are very nice. Proximity to the lavatory was not a bother. Great Business Class seats with wide footrests, huge TV screens and seat controls. Choose our seats for couples and you will be right together. This Premium Economy section is awesome. This is what Business Class was 25 years ago, before lie flat. Plenty of room, wide armrests, bugger entertainment screen, footrests, leg rests, nice recline, plenty of legroom. Worth it at the cost. This Premium Economy section is awesome. This is what Business Class was 25 years ago, before lie flat. Plenty of room, wide armrests, bugger entertainment screen, footrests, leg rests, nice recline, plenty of legroom. Worth it at the cost. I walked back through standard economy section and it looked like a nightmare. I liked these business class seats. They are wide and comfortable, both when flat and when in the relaxed position. The TV screen is large and the touch screen remote is easy to use. There is also some good storage under the footrest and to the side for books, iPads, etc. The cabin service was okay. The crew was trying hard, but the food was not very good, even by airline standards. I was traveling with my partner, so we had the middle seats, where the seats are together and the tray tables are on the aisle. This is great if you're with someone you love, but sharing this type of seat with a stranger would be a little close for comfort. If traveling alone, make sure to book a single seat on the aisle or one of the center seats that is separated with the tray tables in the middle. First Class: 2nd Jan, CAN-JFK (return 10 Jan JFK-CAN, also 1K). Awesome seat, very, very private seat/suite (a little bigger and more private than on the A330-200). Another exceptional flight, impeccable service throughout, excellent food. The only way to travel. China Southern flies 1 versions of Boeing 777-300ER.